Gwen Stacy has lost her spider-powers - making this a very bad time to find herself in Frank Castle's crosshairs! So when the Mary Janes head to a haunted house, is Gwen along for the fun, or will she be one of the ghosts? Thanksgiving should be a happy time with friends and family - unless crime lord Matt Murdock and his ninjas crash the party! Is it time for Gwen to put a stop to the Kingpin of Crime, or does Matt have a thing or two to teach her? Next, the Mary Janes get loud, and Gwen spends some time with her ever-expanding social circle: Captain America! She-Hulk?! Her BPFF (best pig friend forever) Spider-Ham! And her new body-swapping bud, the All-New Wolverine! 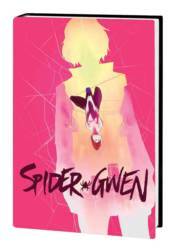 Collecting SPIDER-GWEN (2015B) #7-15 and ANNUAL #1, and ALL-NEW WOLVERINE ANNUAL #1.